It's a big day for Bob Dylan fans with cash to burn. 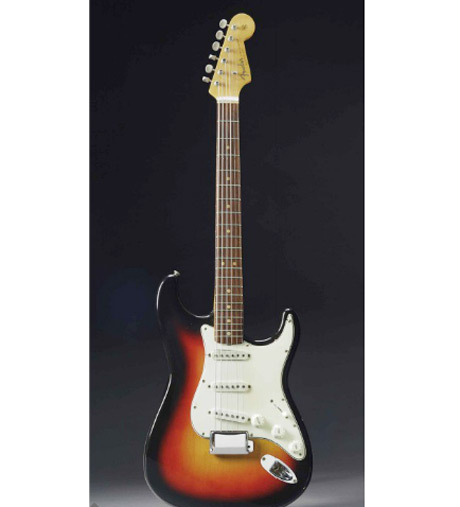 Not only is a handwritten draft of "Mr. Tambourine Man" going under the gavel today (December 6) at Julien's Auctions in Los Angeles, but Dylan's infamous electric guitar from the '60s is being auctioned off at Christie's in New York. Yes, this is the electric guitar, the one that Dylan used at his infamous Newport Folk Festival gig in July 1965, when he turned away from his acoustic roots and played with an amplified band. Dylan also apparently used it during the recording sessions for 1965's Bringing It All Back Home. It's possible that he additionally played it during the Blonde on Blonde sessions, since some lyrics relating to that album were found in the case and are being sold separately; the lyrics up for sale are for the songs "Medicine Sunday" (here called "Midnight Train"), "Jet Pilot," "I Wanna Be Your Lover" (here called "Midnight Suit"), "You Owe Me Your Loving" and "Absolutely Sweet Marie" (here called "In the Inside Darkness of Your Room"). Depending on the lyrics, these are expected to fetch anywhere between $3,000 and $30,000. The guitar is a sunburst Fender Stratocaster, made in 1964. It comes in its original hardshell case with the original black leather guitar strap. It's expected to fetch between $300,000 and $500,000. Dylan apparently left the instrument aboard a private plane a few months after the stories Newport performance. Pilot Victor Quinto is said to have found the guitar and tried to return it to its rightful owner, but received no response. Quinto died in 1977 and his daughter, Dawn Peterson, took possession of the guitar. She contacted the PBS TV show History Detectives in 2012 in an attempt to learn more about the guitar, and they confirmed that the guitar was the one from Newport and Bringing It All Back Home. See the auction listing here.